George Soros would like the world to know he’s still alive. Thomson Reuters accidentally published a templated version of an obituary of the legendary investor earlier this evening. The story, which contained “XXXs” used as placeholders, is being taken down, according to a spokeswoman. 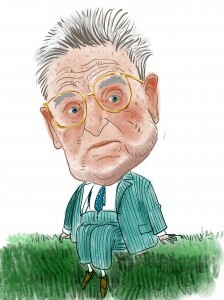 A representative of Mr. Soros’s firm, Soros Fund Management told The Wall Street Journal that “George Soros is alive and well.” At 82, Mr. Soros remains involved in his firm, travels regularly to give speeches and is active in philanthropy. His firm, which now is run by Scott Bessent, manages about $24 billion. The firm has made more than $1.2 billion on bets against the Japanese yen and on the Japanese stock market in recent months. “We did publish an obituary of George Soros in error,” said Barb Burg, head of communications at Reuters. IF SETTING up a hedge fund were easy, more people would do it: bar inheritance or winning the lottery, there are few swifter paths to immense riches. Sadly for aspiring plutocrats, it is getting ever harder to launch a fund. Swaggering financiers once joked that launching with less than $1 billion of outside money to invest was hardly worth their time. Debuts that splashy are now notable only for their scarcity. A new fund typically opens with $50m-100m in assets under management. Even so, and despite buoyant stockmarkets, the number of launches is declining (see chart). Punier funds make for a less attractive business model. A $50m pile might once have been enough to sustain a small firm. Creaming off 2% of assets and 20% of profits—the standard hedge-fund fee formula—could generate around $2m a year given decent performance. No longer. Declining fees and low industry-wide returns have halved that amount. Artemis Investment Management LLP is delighted to announce that Paul Casson has joined them to help Tim Steer manage the GBP504 million Artemis UK Growth Fund, segregated institutional UK Growth accounts and the Artemis UK Hedge Fund. After a BSc in Accounting and two years as an auditor, Paul started his investment career in 1997 with Martin Currie. In 2001 he moved to SVM and then in 2005 to Henderson as a Director of pan-European equities. The Henderson Horizon Pan-European Alpha Fund he ran from 2008 was AA-rated by S&P. Paul has an MSc in Investment Analysis. He is a member of the CFA Institute and a member of UKSIP. Client demands to pull money out of hedge funds fell in April and are expected to remain at a steady level in the coming months as investors wait to see how funds cope with the continuing European debt crisis. Hedge fund administrator SS&C GlobeOp’s forward redemption indicator, a monthly snapshot of clients giving notice to withdraw their cash as a percentage of assets under administration, stood at 2.95 percent in April. This was its lowest since January and a marked decline from March, when it reached 4.33 percent on concern that Cyprus would default following a banking crisis. RBC Capital Markets reported that for the month of March 2013 the RBC Hedge 250 Index had a net return of 1.35 percent. This brings the year-to-date return of the Index to 3.40 percent. These returns are estimated and will be finalised by the middle of next month. The return for February 2013 has been finalized at 0.38 percent. The RBC Hedge 250 Index is a non-investable benchmark of the performance of the hedge fund industry, and currently consists of 4,604 hedge funds (excludes funds of hedge funds) with aggregate assets under management of $1.152 trillion. UCITS-compliant Hedge Funds posted a decline through mid-April, with the HFRU Hedge Fund Composite Index declining -1.08%. HFRU Equity Hedge Index declined -1.62% through mid-April from exposure concentrated in European equity and quantitative strategies, partially offset by idiosyncratic exposure to Emerging Europe, Asia and market neutral strategies. HFRU Event Driven Index posted a decline of -0.20% through mid-April from exposure to Credit, Global Equity Special Situations and Merger Arbitrage strategies. HFRU Macro Index declined of -1.09% through mid-April, from declines in Fixed Income, Commodity and quantitative CTA strategies and mixed performance of Multi-Strategy funds. It was late 2008 that Edgar “Mel” Woolard met with Jeffrey A. Martinovich about trying to keep Woolard’s nest egg from losing any more value during the financial crisis. The retired shipyard worker testified Thursday that Martinovich, then the CEO of MICG Investment Management, advised Woolard to invest in a hedge fund. “I always trusted Jeff,” Woolard testified. “I didn’t know what a hedge fund was. I thought Jeff would take care of me.” Woolard agreed to move $75,000 into the Venture Strategies hedge fund from his retirement account. That was on top of another $100,000 Woolard already had in a separate MICG hedge fund. From the “nice work if you can get it” desk, The New York Times business section offered this headline the other day: “Pay Stretching to 10 Figures.” No, this isn’t about innovators being paid for their smart and indispensable products, a la Steve Jobs. It is a story of hedge fund managers, the tin-pot potentates of the financial world. They are America’s top-dog moneymakers, pulling in more than movie stars, top athletes, even banking CEOs. They tend to shun the spotlight, and for good reason. An average family would have to work for 18 years and 146 days to make what an average hedge fund manager makes in one hour. We must all look like barbarians at the gate to them.